It’s not just about the fat 7.6% dividend. Most auto stocks had a rough year in 2018, but Ford Motor Company's (NYSE:F) year was rougher than most. The Blue Oval's shares ended the year down almost 39% as investors grew worried about Ford's operations around the world. What isn't so easy to see is that Ford is doing the right things to address its problems. I think it's an intriguing buy at current prices, even though the improvements may take some time to show up on the bottom line. Read on to learn why. F data by YCharts. Chart shows the performance of Ford's stock in 2018. There are a few reasons why the stock has fallen so dramatically. Most relate to concerns about Ford's bottom line: Investors look for profit growth, but Ford's profits have been shrinking. Revenue rose year over year in 2015, 2016, and 2017, but margins haven't kept pace because Ford's costs have increased along with its sales. That's a problem of "fitness," to use CEO Jim Hackett's term, and it's a problem that he and Ford's senior team are working to resolve by improving manufacturing efficiency and focusing on higher-margin products. More recently, concerns about some of its regional operations have risen. Ford is working to address all of those concerns, but it has warned that improvements will take time to be visible. Why the decline? Simply put, Ford's product "cadence," the frequency at which it introduces new models, fell behind that of rivals. That's a disadvantage anywhere, but it's a big problem in China's super-fast-paced market. A convoluted dealer network and management that weren't closely attuned to local trends didn't help. Ford has hired a new leader for its China operation, streamlined its dealer operations, and begun work on a slew of new models. That should help right the ship, but it could take a few years to really turn things around -- more if China's new-car market stumbles for an extended period. Ford's biggest sellers in the Old World are its small Fiesta and compact Focus sedans. The Fiesta was all-new last year, the Focus all-new this year, and both have sold well in 2018: Through November, European sales of the Fiesta and Focus were up 30.2% and 9.5%, respectively, in 2018. Ford won't offer its all-new Fiesta in the U.S., but it has been selling very well in Europe. Image source: Ford Motor Company. The problem: Ford's profit expectations for both (particularly the Fiesta) turned out to be overly optimistic. While both have sold well, European car buyers are increasingly choosing crossover SUVs over traditional sedans and hatchbacks, just like their counterparts in other parts of the world -- and Ford has had to give way on pricing in order to meet its sales targets. While Ford's small crossovers, the EcoSport and Kuga (the Escape's European twin), did well in 2018, there's an argument to be made that Ford, a longtime SUV powerhouse, should have done even better. (Ford also sells the next-size-up Edge in Europe, but sales totals are small.) One problem: The Kuga, like the Escape, is an aging model that has lost a step to newer rivals -- and can no longer command top dollar (or top euro) from buyers. It's not yet clear what Ford is planning to do in Europe, though it has said it will invest in more SUVs and commercial vehicles for the region (see below for some details on future products). More details on Ford's plan for Europe are expected later this year. Ford is still doing fairly well in North America, its most profitable regional market. Ford's U.S. sales were down 3.5% in 2018, but sales of its most profitable products held up well. Sales of the F-Series pickups, a crucial profit indicator, rose 1.4% in 2018 and prices have remained strong, despite intense competition from all-new models from Fiat Chrysler Automobiles (NYSE:FCAU) and General Motors (NYSE:GM). Ford's F-Series pickups continue to sell very well in North America, but other products have slipped. Image source: Ford Motor Company. But here again, dated products are probably costing Ford sales. Sales of its mainstay crossover SUVs in the U.S., the Escape and Explorer, were both down year over year through November. And its sedans are in a huge slump: As a group, U.S. sales of Ford-brand cars were down 16.7% through November. Ford doesn't have the excess-capacity issues that led GM to announce several plant closures in North America in November. Its plan to boost profitability in its home region is likely to be less drastic than its old rival's, and it's likely to be driven by a slew of new products in the most profitable segments and market niches: SUVs, trucks, commercial vehicles, and performance vehicles. Ford has a slew of new products coming over the next couple of years that will go a very long way toward addressing all of the above concerns. These new products are all being designed to maximize profitability, with many shared parts under the skin and streamlined options lists intended to simplify manufacturing. Production of the new Ranger pickup began in December and the first examples should begin arriving at dealers shortly. All-new Explorer will be revealed this month and will go into production later this year. For the first time, there will be a hybrid version. A revamped version of the Transit commercial van will debut this year. Note that the Escape and Explorer account for about 70% of Ford's total SUV sales; they're very important, and not just in the U.S.
An all-new off-road SUV called the Bronco, based on the Ranger's underpinnings. Another all-new off-road SUV, smaller than the Bronco. An all-new battery electric high-performance SUV, the first of six new battery-electric Fords due by the end of 2022. A revamped F-150 pickup, along with a first-ever hybrid version. The Super Duty pickups were all new for 2017, but they'll be significantly refreshed before the end of 2020. Beyond the above, Ford has promised some additional new products tailored specifically to the Chinese market. And while sedans are no longer a priority at Ford because of declining sales and concerns about profitability, the company's iconic coupe is set for a revamp: An all-new Mustang is expected in 2021 -- and, yes, there will be a hybrid version. The midsize Ranger pickup will arrive at U.S. dealers soon. Many more new Fords will follow over the next two years. Image source: Ford Motor Company. But why invest in Ford now, when an economic downturn seems to be looming just over the horizon? The answer lies in Ford's 7.6% dividend yield -- specifically in Ford's promises not to cut its dividend unless things get dire. 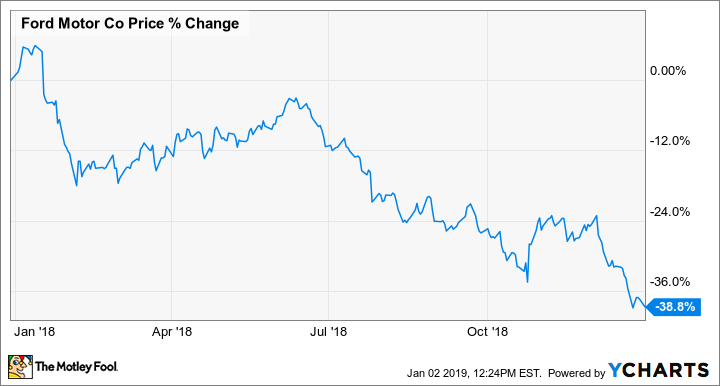 CFO Bob Shanks has said repeatedly that Ford intends to maintain its dividend at the current level ($0.15 per quarter) through the next recession. That's not an empty promise: The cash flow from Ford's captive-financing subsidiary will cover much of the cost of paying dividends, and Shanks has said that Ford will be willing to tap its hefty cash hoard ($23.7 billion as of Sept. 30, 2018) if needed to ensure that the payments continue. So to answer the question at the beginning of this section: If you invest in Ford now, and reinvest that dividend through whatever economic storms and restructuring pain lie ahead, you might be very pleased with the results when the economy starts to recover and buyers find Ford's showrooms full of new products. Ford's stock soared after the 2008-2009 economic crisis, rising 370% from the end of 2008 to the end of 2011. Why? Ford's sales jumped in the early stages of the economic recovery because it had new products in showrooms while rivals were scrambling to restart stalled development programs. Will history repeat? It just might. Check out the latest Ford Motor Company earnings call transcript.